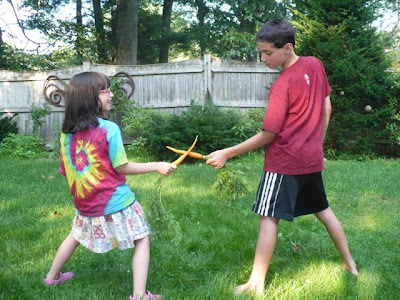 Summer brings abundance of math toys. Who needs cheerios or marbles when you have fragrant, smooth, sweet, colorful delights to count, compare, measure and then gobble up. 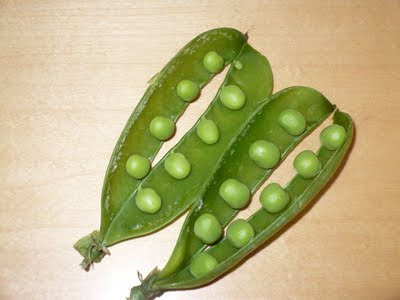 How many peas are there inside each green pea pod? Do all the pods from the same plant host the same number of peas? 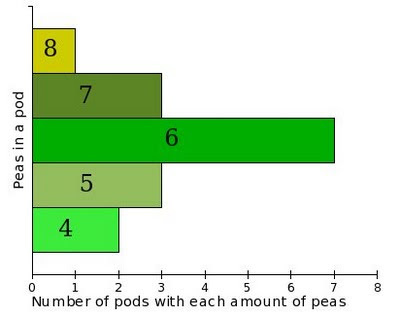 Check it out yourself and make a bar plot to describe the distribution of peas in your snap pea pods. 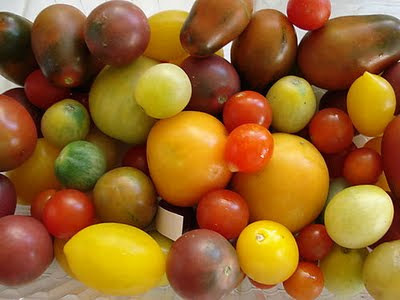 Heirloom tomatoes: yellow, green, purple, red. What color is the sweetest? What is the sourest? Heirlooms are expensive, but their rare availability makes me splurge on them once or twice a year. This year I decided that our kids are big enough to be able to enjoy the tomatoes’ exquisite taste. 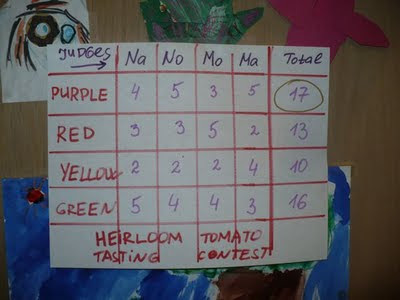 We did heirloom tomato sampling and ran a contest. We cut baby heirlooms into four little pieces. Each of us tried a few pieces of each color and ranked the colors by their sweetness (5 was the sweetest, 2 the most sour). Surprisingly, our opinions varied vastly. We created a chart and added all the ranks. Purple tomatoes were voted the sweetest, yellow – grimacingly sour. This chart is still hanging on our refrigerator to reinforce the memories. Kids loved the game and a week later suggested that we do the same with the canollis that a guest brought. 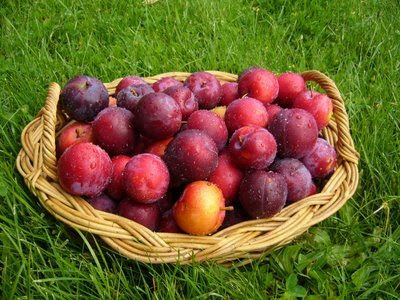 Plums: seductively purple, innocently yellow, confidently bright magenta. Their variety and colors can compete with a lipstick selection. Can you tell a plum type by its taste? Cut them into pieces, close your eyes and see if you can do better than chance (guessing correctly over 50% of the time for two types tasted in equal amounts, 33% for three etc 100%/n types)? Can you distinguish between plums by shape, with your eyes still closed? How many large plums are there in a pound? How many little plums? How many little plums can you trade for one large plum? Do larger plums always have a larger seed? You can eat your fruits and veggies and do math in the same time. What can you do, what can you do, what can you do with the carrots? You can measure your height with them. 10 carrots tall? You can count your bites while eating them. 9 bites? You can imagine you are a Musketeer and fence with them. Wait, you can even scratch your back or head with them. And, for the finale, be adventurous and swallow them! P.S. Scientific studies show that kids' brains take a reverse evolutionary zip during summer month and by September they are two months behind in math and reading. Check out this Math Resources page for more pointers to math-infused books and games. Here is a great fruit puzzle to brainstorm as a family: Mess at the Marrakesh Market. Apart from getting very hungry when I look at all your yummy fruit pictures, I keep thinking of how surrounded by things we are that are perfect for math. It makes it always so much more enjoyable when we give our kids something tangible to work with, rather than three circles plus two circles on a whiteboard, etc. The other thing that always works well with our kids is the storytelling; we have two girls, so I usually end up telling a story about a princess, fairy or adventuress who is stumped by some math problem. Works a charm (almost) every time. I absolutely agree with you. 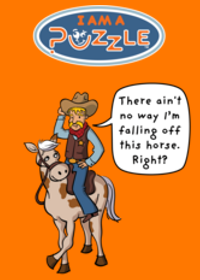 Exciting, relevant context combined with encouragement and confidence boost do magic. After visiting a medieval castle in Northern Italy my 7 year old daughter asked: "If there is a person that lowers the bridge to the castle every morning and raises the bridge every evening. He earns 1 euro for each of the operations. I wonder how much will he earn in a year?" She was thrilled to learn how to add 365+365 in a column and thinking it is the coolest trick, asked for more of such additions on the next day. This is a wonderful article. These type of articles keeps the users interest in the website. I have bookmarked you to check out new stuff of your blog. A must read!!!! Such a great article its tell us how to manege your food buying account with math thanks for share it sop format .